Since I am a liberty minded writer, I would be amiss if I didn’t address a recent viral video. I can almost certainly guarantee that a lot of people on both sides of the isle are going to get upset. But this is what I think. If you are not comfortable with stretching your comfort zone of thought, you should probably click away right now. Don’t worry if you don’t get pissed off. Part 2 will surely do it. First, DUI checkpoints are not unconstitutional. In Michigan Department of State Police v. Sitz, the Supreme Court ruled that the program conducted by the Michigan State Police was consistent with the Fourth Amendment. This ruling paved the way for conducting sobriety checkpoints in a way that does not violate rights. Several years of case law helped mold the practice as well. The short of it is that police must perform checkpoints a certain way. Officers cannot subjectively target motorists and must stop vehicles in a pre-determined pattern. The department must provide notice and usually do so by news announcements and signs clearly indicating a checkpoint is ahead. 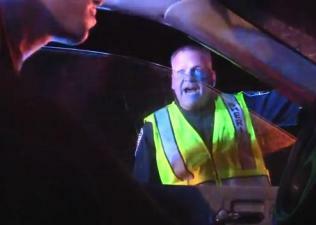 Checkpoints must also be conducted by highway patrol, meaning at least one officer must be present. I agree with the court’s ruling. We have the right to travel freely by foot. Operation of a motor vehicle on public roadways is a privilege, not a right. As such, it is subject to regulation. Vehicle registration, driver licensing, and traffic laws all fall under the regulation that courts have deemed reasonable. While I can’t speak to every traffic law as there are thousands, I find few that are unreasonable in my opinion. Sobriety checkpoints are indeed a nuisance and quite possibly only effective at being a nuisance, but I think they are reasonable. The officer in this video is clearly agitated and he could have behaved in a more professional manner. But we must remember that he is human like us. When you take the path of most resistance, like Chris Kalbaugh did, you risk being treated poorly. It’s part of the territory. Trust me when I say I know firsthand. But, I also know one can make a point without poking a cop in the eye. Mr Kalbough went through great effort to engage that officer. He got what he was looking for. Mr Kalbaugh also erred when made several claims in his video that are just not true. He asks if he is being detained, which is always the best course of action. He claims that the officer detained him illegally. His claim rests on the idea that the offer must specifically inform him he was being detained. However, when the officer ordered him to the side of the road, he was being detained. That is very clear. Terry v Ohio establishes the precedent that an officer may indeed detain and search a person he or she believes has committed or is about to commit a crime as part of an investigation. Once the investigation finds no criminal activity, the subject should be released. Once a search of the car indicated no drugs, Mr Kalbaugh was released. The officer also has the authority to extract Mr Kalbaugh from the vehicle (open the door). Remember that this was not random and the officer made the determination that Mr Kalbaugh’s behavior warranted a search and seizure. The officer may have very well determined incorrectly that Mr Kalbaugh was committing a crime or about to commit a crime, but that was his determination nonetheless. Should Mr Kalbough wish to challenge the search, he can do so in a court of law where an impartial judge will review the evidence and rule accordingly. I’m not so certain the judge will rule in My Kalbough’s favor. Mr Kalbough was correct in stating that he was required to stop at a checkpoint and that he didn’t have to answer any questions. He is not correct in his claim that he is free to travel without being stopped. Remember the bit about driving on public roadways being a privilege? There’s also the path of least resistance issue again. If there is reasonable suspicion and he chooses to not answer questions and is detained, he will likely pay out the nose to have an attorney answer the questions for him. Then, Mr Kalbough claims that it is illegal for the officer to request identification. That is grossly incorrect. We agree to produce a valid driver’s license to prove we are legally authorized to operate a motor vehicle on public roadways on request by a competent authority as part of obtaining a license. Licenses exists for one reason. My Kalbough then denies consent to a search. He is correct in stating that a search subsequent to a denial is unlawful. You should never consent to a search. Make them work for it. And they did. A dog sniffed his vehicle and indicated drugs were present. Probable cause was established. Consent was no longer needed. Did the police trick the dog into indicating? Did the police get the dog to scratch up his car to teach him a lesson? We can’t tell from the video. However, if his vehicle was damaged by the dog and no drugs were found, the department is liable. Police departments make such payments quite frequently. He can also challenge the consent in a court, using that impartial judge I spoke about earlier. Remember the concept of path of least resistance? The officers found air fresheners under the seat. Did Mr Kalbough put them there to throw off the dog so it would produce what the officers said “wasn’t a very good alert?” We’ll never know. He didn’t address that issue. The last 30 seconds of the video are troubling. If indeed Mr Kalbough’s claims about what Officer Ross told him are true, the last 30 seconds are very troubling. However, Mr Kalbough can produce no audio to back up his claims. The only evidence he can produce is that he went looking for a confrontation and got one. Lastly he wishes us a “Happy 4th of July.” The irony in the fact that he ignored the real reason for the day in his farewell while “fighting for liberty” is astounding. To me it is an final indication of the ignorance he demonstrates in the first six minutes and twenty-seven seconds. In the end, Mr Kalbough did very little for liberty and instead perpetuated ignorance.